Hi, Friends! Today I’m bringing back a blast from the past with an updated look! 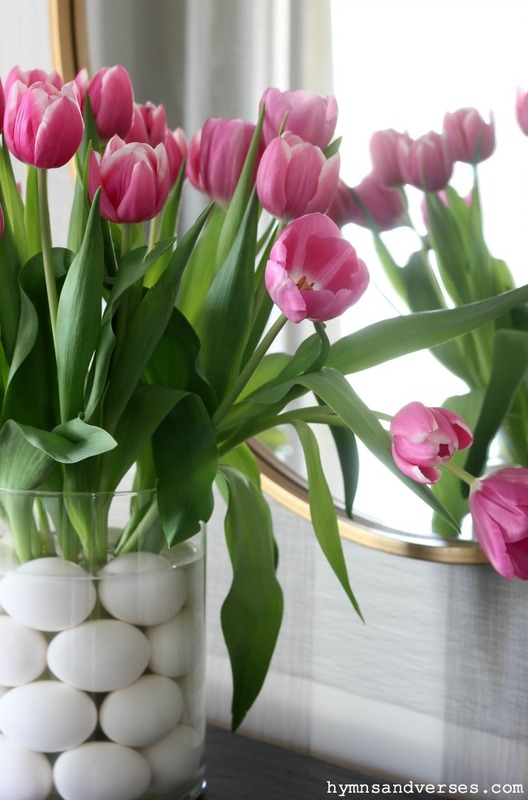 This easy spring tulips and eggs centerpiece is the perfect arrangement for your spring table! I first posted this idea way back in 2013!!! As I’ve been updating some of my older blog content, there are some posts that I think deserve another look! And, this is one of them! When I initially shared this idea, I used white tulips and white eggs! You could use brown eggs or colored eggs, plastic eggs or real eggs! You choose! And, you can find faux eggs now that look very realistic. Just make sure that if you are using a colored option that the color will hold up in water. As I did in my original post, I used what I had on hand – real, unboiled eggs. If you think that is wasteful and can’t bring yourself to do it, don’t. Use faux instead. But, this pretty centerpiece is one you can quickly pull together in a matter of minutes – all with things you can pick up at the grocery store and it makes a big statement! The main thing you need is a straight, cylinder type glass container. I picked THIS ONE up at WalMart for under $5. Simply start at the bottom of your glass container and place eggs around the perimeter. Leave the center open. Now add another layer of eggs. Continue on until you have about four layers. They stack really easily and stay in place well because the container is straight. Then I add the tulips and water. 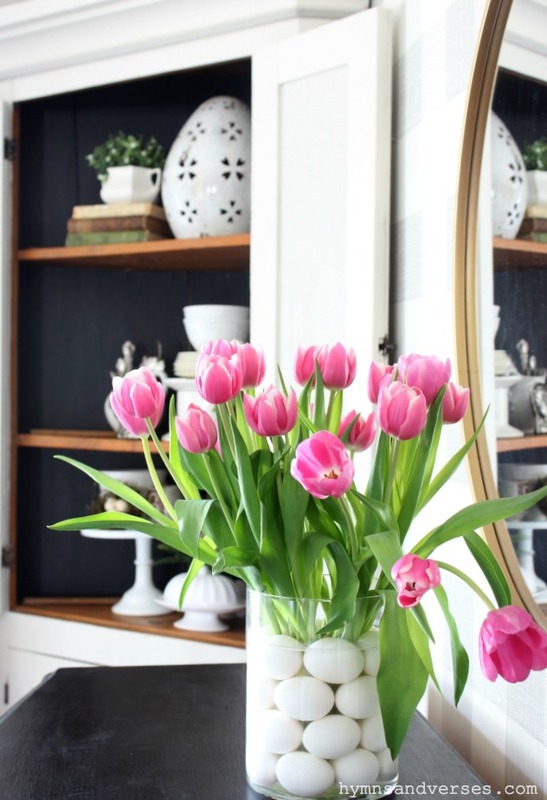 Make sure to give your tulips a fresh, angled cut before adding them to the vase so they get a good drink of water! Tulips are usually closed when you purchase them at the grocery store or florist. My photos today were taken after two days. Now, the tulips were pretty when the buds were closed, but when they open they droop and stretch towards the sun — Gorgeous!!! 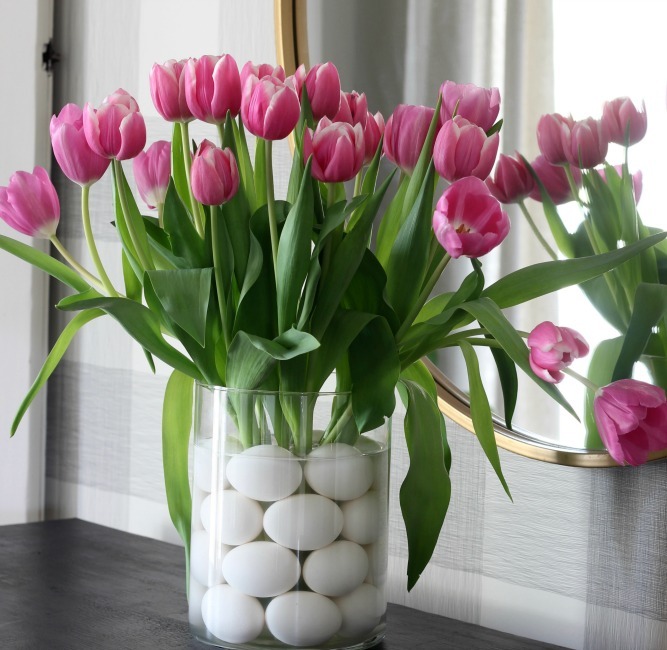 So, if you want to use this spring tulips and eggs arrangement for your Easter table, I would put it together on Thursday or Friday! All three arrangements are simply gorgeous! I especially like the eggs & tulips. What a fun and beautiful idea. I saw this and wanted to read how you did this. It is real eggs!!! It does look striking as a centerpiece. What a neat idea!!! My daughter has a couple chickens with colorful eggs. That would be interesting!! I do like the white and pink.